Tags are simply words or phrases that you can ‘virtually attach’ to web pages, images or text. By adding tags, it becomes easier to find things you are looking for. The articles in this blog are all tagged – scroll down this page and you will see a ‘tag cloud’ of the most commonly used tags. Search engines like google can make use of the tags attached to things. Similarly sites like Flickr allow you to find images by searching through tags. The tags are added by the person who uploaded the image. Tags can help you organise your own work – Diigo.com is a great way to save all of your bookmarks when browsing the internet- anything you find on the web that you might use in the future can be tagged and filed away very simply. I have over 2000 web pages tagged – advanced features allow you to save highlights you make to web pages and attach virtual post-it notes to them. Diigo would also be a useful tool for some 6th form subjects which require students to research and organise a range of information from the web. Some web applications make use of tags in a visual way. 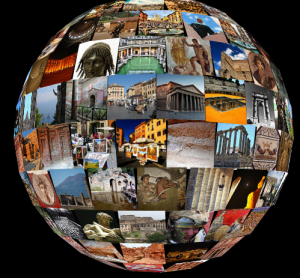 Taggalaxy allows you to build worlds of images by entering key words – it draws the images from Flickr. This is great for visual starters of to get students to think about how words are connected.